To make it as easy as possible for you to get the gear you want, we offer a range of instant finance options. If you spend £250 or more online, you can choose to pay over 48, 36 or 24 months. The majority of decisions are given instantly, so you could get your new gear sooner than you thought! Applying for finance couldn't be easier - if your order totals £250 or more, simply proceed through the checkout as normal, then select Pay by Finance on the payment page, then click the orange APPLY FOR INSTANT FINANCE button. This will start your application with V12 Retail Finance, our finance partner, and completing this form should take approximately 10 minutes. You should get an instant answer on whether your application has been successful, though in some rare cases V12 may need to look at the application in more detail. The AER Compact 60 III is a professional, compact and powerful acoustic amp. Although especially developed for the enhancement of acoustic instruments the AER Compact 60 is also suitable for other instruments, even electrical ones. Singer-songwriters will have everything they need thanks to the separate channels for vocals (XLR input) and guitar (jack input) each with a dedicated EQ. Throughout the years, the Compact 60 has become a standard in amplification, delivering the outstanding AER tone in nearly all possible situations. All AER-systems are subtly dynamically controlled, which ensures absolute reliability in full load operation despite strikingly small sizes and little weight. The AER Compact 60 III design concept was focused on the singer songwriter who requires outstanding reproduction of their instrument and vocals in a handy unit with which is easily portable. The Compact 60 amp can accomplish this while astonishing audiences and sound engineers with excellent sound and professional instrumentation. 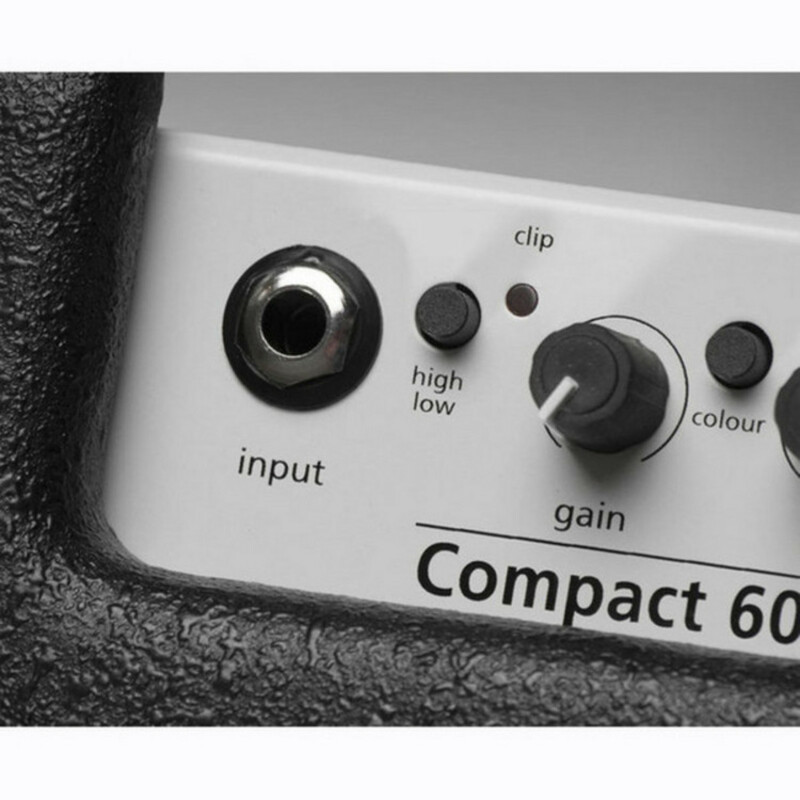 Throughout the years, the Compact 60 has become a standard in amplification, delivering the outstanding AER tone in nearly all possible situations. The AER Compact 60 amplifier features an unbeatable combination of size, power, and sound quality. Nicknamed "Bingo," the Compact 60 is only 18lbs, making it is one of the lightest acoustic amps on the market. Don't be fooled by the power rating - the 60 watts that this amp produces are far more efficient than most other amps. The Compact 60 is louder than many other amps rated at 200 watts! The preamp section of the Compact 60 is designed to soften the harsher qualities produced by most piezo pickups. This amp can tame even the most unruly pickup systems, making them sound clean and natural. It's a simple to use, plug and play amp which requires little expertise from the user. Most players find they spend far less time adjusting the tone controls with this amp than many others as it usually sounds perfect when set flat. The outstanding performance of the Compact 60 has won it admirers the world over. Great acoustic guitarists such as the legendary Tommy Emmanuel and John Renbourn perform with the AER Compact 60. Among Gypsy jazz guitarists, the AER Compact 60 has become the choice for amplification. Stochelo Rosenberg, Romane, Bireli Lagrene, Dorado Schmitt, and so many other greats of the style use this amp. Although marked as an acoustic amp, the versatile Compact 60 is used by many archtop jazz guitarists. Gene Bertoncini, Jack Wilkins, Russell Malone, and Martin Taylor have replaced much larger tube amps with the light weight and great sounding AER Compact 60! The AER Compact 60 has two input channels, one of which is a line input and the other a combination line/mic input. Many utilise these multiple channels to run dual pickup systems and/or microphones or you can even have two individual musicians performing through the same amp. This AER amp features an 8" twin-cone speaker, 4 digital effects, three band tone controls, and a stand mount. The rear of the amp has the following outputs: tuner out, line out, headphones, XLR DI-out, effects loop, and footswitch. The dynamic control features include a subsonic filter, an aural enhancer, and a limiter. Mains power: Mains voltage (depending on model): 100, 120, 230, or 240 V AC , 50-60 Hz. To view the full specifications of the AER Compact 60 Acoustic Guitar Amp please download the PDF above.